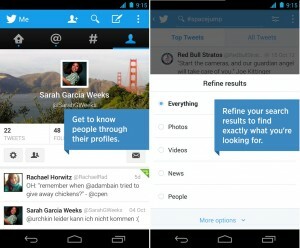 Twitter has announced several search improvements in its last update, soon available for Android and iOS. This version will be more focused on helping you to find the relevant information, thanks to the new refinements to search. This was one of the weakest points Twitter had so far, as with its huge amount of information, a powerful search engine was much needed. With this update, the main interface will remain the same, but the changes appear when you go the search box. Now your results will be split in “Top Tweets” and “All Tweets”. You will have both results in separate tabs, so the navigation will be easier, you just need to toggle between top Tweets and all Tweets at the top of your search results. In addition, several search filters has also been added to improve the searching possibilities. It is possible to further refine your search by adding filters to show you only the wanted results. These filters will allow you to choose Tweets with specific features like photos, video, news or specific groups of people. With these filters, you can see what your friends are saying or looking only the Tweets from the people you follow. Find exactly what you’re looking for. •	Search results now show content that is filtered to the type of moments you want. See what’s trending on TV and close by to you. •	After you’ve browsed through all trends in Discover, you’ll see additional trends about both TV and local content. Better login verification. •	Take a screenshot of your verification backup code when you enroll or generate a new one. Get here the Twitter’s last update available for Android and iOS in the Google Play and iTunes respectively.